We have a block wall foundation that measures 21'4"X20' with a block wall dividing the 21'4" side. Block is 8" with the cores poured with rebar extending out every 4'. We have 20 ga. corrugated decking with 1 1/2" deep channels and we plan on pouring a 6" slab. There are two shoring walls spaced 40" apart on each side of the block wall. The top corse of block is 4" block. Is 4" enough of a shelf for the slab? What size and spacing do you recommend for the rebar? Hi, thanks for visiting all-concrete-cement.com, by the way that is an excellent question! 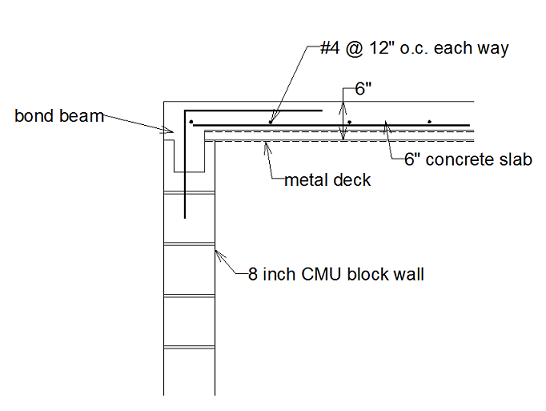 The top course should be 8 inch bond beam build from 8 inch block and there should be at least 2 inches deck bearing on top of CMU block, see detail below. The four inch block will not have enough room for the rebar and concrete to enable an effective connection and transfer of forces from slab to the walls. As shown in the detail above, the dowls that you mentioned spaced at 48 inches on center need to be bent toward the slab. This bent should be about ¾ inches from top of slab. This is to reinforce the top of the slab because at this location the top of the slab will be in tension due to the wall pushing against the slab. On the other the reinforcements at other locations need to be at the bottom of the slab about ¾” above deck (never put rebar directly on metal deck). As the weight of the slab and load on top of slab are pushing downward, the bottom of the slab will be in tension while the top is in compression. Concrete crumples when stretched thus the rebar at the bottom of slab. My recommendation is to use #4 bars at 12 inches on center each way at bottom of slab. The wall shown in the detail above perform two functions: 1 - support the slab vertical load 2 - support the slab lateral load. The 4 inch block mentioned may be sufficient for vertical load but will definitely not able to withstand lateral load due to wind or seismic event.